Courtesy of Bob Weir, Solo Swims of Ontario, Canada. The Great Lakes are a collection of freshwater lakes located in North America on the Canada–United States border. The Great Lakes consists of Lake Superior, Lake Michigan, Lake Huron, Lake Erie, and Lake Ontario and form the largest group of freshwater lakes on Earth, containing 21% of the world's surface fresh water. Between the ages of 17 and 30, Canadian swimmer Paula Stephanson swam across all five Great Lakes. Her longest swim - 25 hours 38 minutes - was her last one in Lake Michigan. But her first swim - 22 hours 30 minutes to traverse 50.5 km across Lake Ontario - was also a long one. 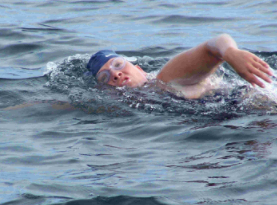 Her achievement replicated the Great Lakes odyssey of fellow Canadian marathon swimmer Vicki Keith (completed in 1988).